Thank you Ann-Cabell Baum and our generous sponsors! Your generous support made the 4th Annual Artsplosure Cocktail Fundraiser a great success! All proceeds are benefitting the 37th Artsplosure - The Raleigh Arts Festival on May 20-22, in downtown Raleigh. To learn about this year’s festival offerings visit www.raleighartsfestival.com or download the free Artsplosure app available in the Apple App Store or Google Play Store. Join us for a special exhibition of new works by NC artists and supporting events where you’ll get a behind the scenes peek at what goes into creating an exhibition at Artspace. See all the submitted artwork during the exhibition preview May 19–30. Then come back June 3–25 to see the final selections and awards, juried by Marshall N. Price, Nancy Hanks Curator of Modern and Contemporary Art at the Nasher Museum of Art at Duke University. All works in the preview and exhibition will be for sale, with proceeds supporting the Artspace Inspiration Fund. Visit artspacenc.org for more details. Sign up, find out what’s going on downtown and win free stuff! www.WeLoveDowntown.com ©Copyright 2005-2016, Triangle Downtowner Magazine/Raleigh Downtown Publishing, LLC. 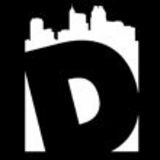 The name, logo, and any logo iterations of the Triangle Downtowner, Triangle Downtowner Magazine and the Downtowner D graphic are a TM of Triangle Downtowner Magazine/Raleigh Downtown Publishing, LLC. No part of this publication may be reproduced without express written permission. Be sure to check out BOOM! Magazine, our sister publication for baby boomers with articles on health & wellness, dining, travel, personalities in 50+ & Fabulous, finance, history, and much more. Available all across the Triangle and online, www.BoomMagazine.com. For those of you who are into statistics, here’s a few numbers from this year’s votes: Total votes: 10,152 Guy/girl ratio: 33.5/66.5% Age demographics: 21 to 24: 6.6%; 25 to 34: 25.2%; 35 to 44: 26.1%; 45 to 54: 21.4%; 55 to 64: 14.4%; 65 and over: 6.3% Typical magazine pickup location: Downtown Raleigh/ Cameron Village/Seaboard Station: 39.2%; North Hills/ North Raleigh: 21.2%; Downtown Durham: 14.1; Online only: 10.4%; Cary: 5.1%; Apex: 3.3%; Other cities: 2.6%; Chapel Hill: 2.1%; and Wake Forest: 2.0%. Read online in addition to print: 38.5%. We hope this list provides you with plenty of new restaurants to choose from, businesses to visit, and things to do! Be sure to watch for “Best of Downtowner Awards” stickers on business doors and windows and you’ll know there’s something good waiting for you inside. Thank you to all who voted and help make the Best of Downtowner Awards a great way to support local business. new names in the winners’ lists, as well as returning winners from last year who rocked the ballots again. We couldn’t agree more with our voters’ choices and think you guys have the best and most diverse taste of any magazine readers in the Triangle. As always, the food and drink categories garnered the most votes and, judging by your picks, the most popular restaurants make a point of using locally sourced, sustainable ingredients. In general, the foodie scene across the entire Triangle is pretty amazing and we’re lucky to have so many great styles, price ranges, and places to choose from. We’re proud to continue featuring only locally-owned businesses in the Downtowner Awards, and equally proud that other Triangle area magazines are doing the same. Buying local ensures more of our spending dollars stay in the local economy, helps to create (and keep) jobs, drives growth, and shows support for our community. Congrats to Chef Corbett Monica and Bella Monica So, be sure to support and buy local! for winning Best Italian for the 5th year in a row. Cave 1912 Counting House at 21C Hotel Death & Taxes Mesa Latin Kitchen more. Taverna Agora (Re-opening) BEST RESTAURANT OVERALL Bida Manda NOFO @ the Pig brought home the bacon for Best Bloody Mary and Best Gift Shop. Boulted Bread Guglhupf Bakery & Patisserie lucettegrace Neomonde Mediterranean Sugarland Yellow Dog Bread Co.
Beansprout Chinese Five Star Imperial Garden Peace China For 40 years, Arthur and Anya Gordon of Irregardless Cafe have paved the way for vegetarian/vegan food in the Triangle. Join us for lunch or dinner at any Shiki or Tasu Asian Bistro on Saturday, May 14th, and we will donate a percentage of your purchase directly to The Tammy Lynn Center for Developmental Disabilities. Enjoy the best sushi in the Triangle and authentically prepared, Asian Cuisine, while supporting children and adults with developmental disabilities. ADORE Designer Resale Boutique dress. Best Bakery winner La Farm owner, chef, and master baker Lionel Vatinet. The delish Apricot danish (flaky pastry, a touch of apricot jam and cream cheese, apricot, rock sugar, and pistachio) is just one of the many incredible Best Desserts at lucettegrace. The LGBT (lettuce guacamole bacon and tomato with limetobasco mayonnaise) helped bring home the Best Sandwiches award for Person Street Pharmacy Café. Acorn Oak Tree Onionhead Monster Squirrel Wolf A big Thank You to all who voted in this year’s Best of Downtowner Awards! Be sure to check out any new restaurants or businesses you may have discover in this issue, and remember, always buy local! From the Publisher nother Best of Downtowner Awards is in the books. Counting all the votes definitely took a while (thanks to everyone for killing the ballot box this year! ), but it was well worth the effort to discover so many new places to check out. We received some great feedback from this year’s Awards and have already started working on fun new categories for next year. 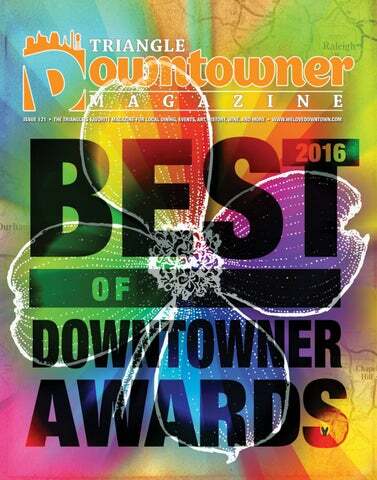 Congrats to all the winners and reader favorites in the 6th Annual Best of Downtowner Awards! We’ve been looking forward to summer for what feels like forever and it’s finally almost here. In our next issue, Get Out!, we’ll include plenty of ideas for cool things to do under our blue summer sky. Know of a great outdoor event happening this summer, something fun to do, or a littleknown place to spend time outside? Tell us more so we can include it in our list (http://bitly.com/TDMcontactus). Food truck rodeos, Artsplosure, outdoor music, patio and rooftop dining, hiking, and walking our dog in downtown are just a few of the things we’re excited about this summer. We hope you’ll join us and we look forward to seeing you out there! This is one of the best breweries in the Triangle from which to order a flight. Every one of their beers is clean, well-balanced, and fully-developed. If you go in looking to discover a particular favorite, you may find it difficult to choose. • Pale Brüe Eyes (4.6% ABV) – a very mellow, pale ale with hints of vanilla and banana esters, with a slightly bitter finish. It’s a smooth, quaffable brew that’s a solid choice for your first round… or fourth. code. While I sat talking with Eric, Tucker kept a watchful eye on the brewmaster in the next room, Brad Fogle, who was transferring a batch of their barrel-aged Edinbrüe Scotch Ale from the barrels into the bright tank. Brüeprint is a 20-barrel brewhouse that Eric claims was borne from his background in engineering. In his previous life, he was a water treatment engineer and traveled all over the east coast. “It’s amazing how similar water treatment is to brewing,” he tells me, “things like getting certain enzymes to activate at the right temperatures.” Though his career laid the groundwork for his brewing expertise, Eric felt handcuffed by his consulting position. He would often brew a small batch of beer after coming home from work and quickly discovered that his friends and neighbors were graciously drinking all of it in his absence. So, he kept upping his production until finally deciding to make the switch to running a brewery full-time. “I knew I had some good recipes,” he says, “so I thought I could do it professionally.” Brüeprint boasts a stellar lineup of quality flagship beers with a deep bench of rotating seasonal offerings. • Brüe Scarlet (4.8% ABV) – this is a great go-to local amber ale if you’re shopping for a 6-pack on your way home from work. It’s slightly bitter for an amber, but has a good copper color and a creamy caramel warmth. • Brüenette Brown Ale (5.2% ABV) – a deep copper brown ale with hints of roasted barley and nutty chocolate. This beer has a robust, woody flavor without overpowering the palate. If you’re a fan of malty browns, this is a terrific addition to the market. • Edinbrüe Scotch Ale (8.2% ABV) – a very smooth, rich brew full of roasted caramel and toffee notes. This is probably one of my favorite local beers, though I must admit I’m partial to Scotch Ales. Just be careful, the high ABV is cleverly masked by its sweetness – it can sneak up on you. Though Brüeprint has garnered a loyal following of locals from around Apex, they are still battling the deprecated notion that they are nothing more than a bar. If you’d like to come out and witness for yourself the friendly community that is Brüeprint Brewing Company, they certainly welcome your visit. In fact, Saturday, May 14, marks their 2-year anniversary party. They’ll have food trucks, games, and a grand opportunity to join your neighbors for a few delicious brews. Who knows, you might even see your friendly neighborhood beer writer in the mix. Russ is a photographer, brewer, author, and screenwriter. He’s a Raleigh native who has returned home to NC after a decade of writing (and drinking) in NYC and Los Angeles. including Beer, Bands, and Bingo, a day of music and games to benefit the Leukemia & Lymphoma Society. Aside from these special events, there is usually something interesting going on during an average week. Tuesday nights they host a run club, and Fridays are “Kick the Keg Fridays,” where whoever gets the last pint of a keg wins a prize (usually a T-shirt or pint glass). The first Friday of most months they also host live music and an occasional food truck. On any given day there are plenty of board games to choose from and they even have a cozy lounge in the back that feels like you’re sitting in someone’s living room. JOIN US FOR THE JURIED ART MARKET, MUSIC, PERFORMANCES, INTERACTIVE ART, KIDSPLOSURE AND MORE! Last year we contributed over half a billion dollars to education. The North Carolina Education Lottery has raised more than four billion dollars for education since 2006. Hereâ&#x20AC;&#x2122;s to our 10th anniversary and to all the bright futures across the state. Must be 18 to play. Problem Gambling Helpline: 877-718-5543.
e love gossip. Okay, not really, but we love hearing about local growth and we love to share it with our readers. Overhear a rumor about a new restaurant, bar, or business opening in the Triangle? If it’s in downtown Raleigh, Durham, Cary, Apex, Wake Forest, Chapel Hill or in North Hills, please share! Send us your news@welovedowntown.com and clue us in. To say “Thanks Ya’ll,” we’ll pick a couple of random tipsters each month and shoot you a free t-shirt. Carroll’s Kitchen will be going into the old Square Rabbit space at the corner of Martin and Wilmington Streets. Carroll’s is a 501c3 non-profit restaurant opening this summer that will serve locally-sourced food, and work to end homelessness in Raleigh by providing job training, life skills development, and housing for single women from local shelters. Find out how you can help on their website, www.carrollskitchen.org. According to Twitter rumors, The House is moving into the Holly’s on Hargett (Moe’s Diner) space and will consist of a bar & bottle shop with bar food offerings. Brewerks Café and Bakery is opening soon in the old Quality Grocery space in historic Oakwood. Their website says they will offer fresh-baked breads and pastries, in-house roasted coffee beans, fresh tea/juices/smoothies, breakfast & lunch, togo meals, produce, and groceries. http://brewerks.cafe The Milkbar is opening soon in Glenwood South in the Creamery building’s old Cashmere space at 410 Glenwood Avenue next to Sullivan’s Steakhouse. The bar will feature new roll-up side doors, skeeball, cocktails, and local craft beer. The Milkbar is owned by Matt Kenner, who also owns The Anchor Bar on Fayetteville Street and previously owned Noir. www.milkbarnc.com The recently closed Echelon Hospitality’s Zinda in downtown Raleigh will become Bare Bones, a casual style restaurant featuring pool tables and shuffleboard. Menu items will include casual fair such as burgers, brisket, and ribs. Opening is scheduled for later this summer. Raleigh restaurant bu•ku will be opening a second location in Wake Forest later this fall. Owners Sean Degnan and Tony Hopkins say it will be on Rogers Road near the Heritage Development. More on bu•ku at www.bukuraleigh.com. Provenance’s dining room is modern, organic, and minimalist, with an open floor plan, loft, and plenty of natural light. The Pan Roasted Buttermilk Chicken, with its exquisitely crisp skin, juicy meat, and ranch-like seasoning, was served with asparagus and a delicious brown hulled Carolina rice that was aged in wood barrels with laurel bay leaves. The beautifully presented Cast Iron Mako Shark was a portrait of spring, paired with a colorful trio of radishes, charred onion petals, and creamy wheat berries. Microneedling $250 during May (normally $350) This treatment, also known as Collagen induction therapy (CIT), is an aesthetic medical procedure that induces production of collagen within the skin. Our master certified staff uses the SkinPen™ for this in-office skin rejuvenation treatment. SkinPen™ improves fine lines, wrinkles, acne scars, hyperpigmentation, stretch marks and other conditions by stimulating your skin’s own natural ability to repair itself. When it comes to the science, your skin type, and quick recovery time, the SkinPenR advantage is clear. The Embered Carolina Pearl Oysters sat nestled in a mound of ashen fruitwood and smoldering cedar shavings, finished with a luxurious ham-fortified whey, extra-virgin olive oil, and wood sorrel. What made the meltingly tender petite filet mignon stand out were the braised hanger steak beneath it and the mushroom ketchup. ($8), a combination of moist devil’s food cake, airy milk chocolate mousse, crisp chocolate cookie crumbles, snappy black cocoa nibs, and soft-serve chocolate “frosty” ice cream. Featuring five different chocolates in five different preparations, this amazing dessert was neither cloyingly sweet nor death by (local) chocolate. With its ambitious mission and ethically-prepared, sustainable local food, Provenance strives to change not only how people eat, but how food is grown. Who knew politics could taste so good? The Head On Beaufort Shrimp watched us as we dug into their bed of tender, petite rouge peas (reminiscent of red black-eyed peas) and earthy carrots, and a remarkable barrel-aged soy sauce, fermented fish sauce, carrot puree, and squid ink. Brian is a food writer, culinary instructor, and chef. His business, Love at First Bite, specializes in private cooking classes and intimate dinners. For more information, please visit www.loveatfirstbite.net. Brian can be contacted at brian@welovedowntown.com. Wine pairings for your outdoor cookouts, picnics, and porch parties By Liz Olivieri • Photo by Nancy Thomas of the black bean burger lovers, something with a little bit of weight, but a little bit of spice will pair well – like the La Mateo Tempranillo from Rioja. It’s easy drinking and just the right amount of acidity to balance out your veggie patties. It’s that time of year when we crawl out of our winter hibernation caves, unbundle our layers, and strip off the blankets, ready to enjoy the beautiful North Carolina weather. Whether it’s just going for a walk around the city or planning a trip across the state, everyone wants to cure their cabin fever and go, go, go. Backyard cookouts and picnics in the park are two staples that go hand-in-hand with good weather and good company in this city. Few things make a delicious meal even better than choosing the right wine to go with it. Paired with a good wine, even the simplest foods like a hot dog from the grill can transform into a unique pairing experience. Here’s a quick go-to guide for pairing wines with some of our favorite foods of the season. This list is by no means exclusive! Next time you’re shopping for your next party, gettogether, or simple dinner on the porch, stop by and ask us for a pairing suggestion and our seasonal favorites. Grilled Vegetable Kabobs A healthy kabob is a great change of pace at your cookout and there are some delicious wines to pair with them. Gruner Veltliner is an Austrian white grape that is one of the few wines versatile enough to pair with vegetables. With citrus fruit and green apple flavors, complimented by the classic white pepper characteristic of the grape, these wines are some of the best for food pairing in general. Try the liter-sized Paul D. Gruner Veltliner for something lighter and more citrus-fruit driven, or the Lagler Gruner Veltliner from Burgberg, Austria for a classic example of this grape varietal. Danielle and Lauren enjoy a glass of wine on the new patio outside Cafe Helios on Glenwood Avenue. It’s finally getting to be prime lobster season. There are few better pairings for lobster than Chardonnay. Although the grape is often associated with rich and creamy wines, there are many different styles out there beyond the overly oaked and heavy, buttery wines made famous in California. Sanguoard Guyot’s ‘La Roche’ from Burgundy is a beautifully balanced Chardonnay that has enough weight to hold up to a succulent lobster claw, but also expresses its Burgundian terroir through a pop of minerality on the palate. Fish Tacos Whether you’re making them spicy or topping them with a tasty mango fruit salsa, tacos made with fresh-caught North Carolina fish are one of my favorites. Domaine du Prince Blanc or the Domaine Haut de Mourier Viognier are two refreshing white wines from southern France. The balanced, tropical and stone fruit flavors with a kiss of acidity (which helps maintain a refreshing quality these regional wines sometimes lack) provides a burst of citrusy flavor almost as if you were squeezing a lemon or lime right on top of your tacos. Pulled Pork A Southern mainstay that this Yankee transplant has yet to perfect in her kitchen but thoroughly enjoys is pork BBQ. Pulled, chopped, or sliced is the only way to do a real cookout (as I’ve learned). And there’s no way you can have a proper cookout without at least one rosé to drink. Pork and rosé are a match made in North Carolina hog heaven. Rosés range from light to mediumbodied and from dry to a little sweet, and there are so many delicious options out there. Some of our favorites so far this year include: the Commanderie de la Bargemone from Provence, which never disappoints for a dry, lighter style with floral aromatics and bright red fruit to compliment; the Mittlebach Zweigelt Rosé from Austria, which has darker fruit and a little bit more body to hold up to even the fattiest pulled pork or Carolina ribs; the Laurent Gauthier Gamay Rosé from Beaujolais is juicy, filled with strawberry and cherry flavors and perfect for Western style; and the Broc Cellars White Zinfandel from California is not your typical white zin. With its lower acid, lower alcohol, and surprisingly dry core, it’s perfect for you Eastern BBQ style lovers out there. through the fried batter like a knife through butter – in short, it’s amazing. Although Champagne may not be a part of your daily budget, there are some less expensive options out there like the Collon Brut that is as delicious for a celebration as it is with your fried chicken or fish and chips. If you’re looking for an even more price-conscious option, the Emendis ‘Can Xa’ Cava is an excellent, alternative sparkling wine from Penèdes, Spain. It has all of the bright lemon and orange fruit of Cava, along with a touch of the biscuit aroma and flavor of traditional Champagne, but comes with a picnic price. a light and red-fruit driven wine with a touch of damp, traditional Italian earth that pairs well with meats and cheeses on your charcuterie board. Fruit Salad Moscato! Many people think of Moscato as cloyingly sweet and just a cheap buzz, but it’s really so much more than that. Lower in alcohol, this wine maintains much of its natural, residual sugar from the grape in the final bottle – with no sugar added. Made in the frizzante style, this is a wine that, when made right, can be enjoyed pleasantly with food and is light enough to enjoy in quantity. Pair it with some fruit for a light snack and you’ve got a delicious evening on the porch. XXXXX Whatever your picnic style – grilling, BBQ, or something simple like veggies, charcuterie, or fruit – enjoy spending time outdoors with family and friends and have fun with pairing your wines. Stop by to see us any time for a new recommendation! Liz works at The Raleigh Wine Shop located at 126 Glenwood Avenue, Raleigh, NC. She can be contacted by email liz@theraleighwineshop.com. What you want, When you want it, The way you want it! Not sure what to order? Try the Sampler for a nice variety of appetizers. You can’t go wrong with The Pit’s Fried Green Tomatoes. Head Pitmaster Joel Dobson is committed to creating the best smoked meats in the Triangle. The Pit has a second floor dining and bar area with an outside patio, perfect for private events. The Pit’s main attraction, their Pulled Pork. The Pit’s BBQ Chicken was remarkably moist and delicious. The Barbecued Tofu is pretty amazing and can satisfy the most hearty meat eater. *** Cabin fever? *** Here is an inside the beltline a cure. Corbett Monica. Stop by 3121-103 Edwards Mill Road and you’ll find some of the Triangle’s best Italian food, cooked to perfection and served in a casual setting. www.bellamonica.com •	Ten $15 gift certificates to NOFO @ the Pig located at 21014 Fairview Road in Five Points. At NOFO, you’ll find an eclectic mix of furniture, gifts, antiques, books, kitchen, toys, and more, plus an award-winning restaurant. www.nofo.com •	Eight $25 gift certificates to Shiki Sushi/Tasu Cary/Tasu Brier Creek. With three locations around the Triangle to satisfy your craving for sushi, steak, Vietnamese, Thai, Hibachi and more! Visit them online for directions, specials and to view their diverse menus: www.shikinc.com | www.tasucary.com | www.tasubriercreek.com •	Two sets of tickets to any shows with NC Theatre, Theatre in the Park, Raleigh Little Theatre, and NC Symphony. With a wide variety of shows to choose from, each has something to offer almost everyone. Visit their websites for more information on shows and tickets: www.raleighlittletheatre.org | www.nctheatre.com www.theatreinthepark.com | www.ncsymphony.org We’d like to thank our readers for making the Downtowner a huge success. Reader Rewards are our way of saying thanks and also to introduce you to some of our great advertisers. Be sure to sign up to win your share! • 1 1/2 oz Stoli Vodka (a Russian agent deserves Russian vodka!) • 3/4 oz lime • 3/4 housemade simple syrup • Muddled bay leaves Shake and strain (because who wants muddled leaves in their teeth...). Pour over an ice spear to keep the drink cold without watering it down, top with soda, garnish with mint. Nostrovia comrade! We Value Local We are a locally owned full-service accounting firm licensed in NC and offer a broad range of services for business owners, executives, &independent professionals. We are affordable, experienced, and friendly. 56 Maori carvings 57 Like many an Internet troll: Abbr. 58 Wine order 61 Interstellar dist. 62 Navigation hazard 64 Slick 66 Cincy-based consumer products giant 67 Like Oscar Wilde 68 “Whatever floats your boat” 69 Energy source 70 “This Gun for Hire” actor 71 Astronaut’s garb 73 Innocent words 74 Mount to mount 76 Word in two state names 77 Soup aisle array 81 Department of Labor training program 82 “Hang in there” 84 Not-too-potent potable 86 Gets in the pool, maybe 87 Seasonal pharmacy offering 88 Frantic monologue 89 Potter’s pedal 91 Arm-twisting 94 Took off 95 Tropical lizard 96 Like jellybeans 97 Like urban population 98 One learning the ropes 99 Toil (away) 100 Bores for ore 102 Wasatch Mountains resort 103 Burn remedy 104 Spread measurement 105 Mint product 106 Often-skinned spot 109 Fan reaction? spayed female and has the word DIVA written all over her. She is 100% made for the stage, with dreams of Broadway. But she has made it clear that she prefers to be a solo act, and would probably do best as an only cat. She’s perfectly fine at keeping herself busy and happy when you’re away for the day. Work full time, need to stay late? That’s no problem; she’ll be catching up on beauty sleep. She’s really a content girl and will try to make her audience (you) happy! She has her opinions and isn’t afraid to share them with the world. She is definitely looking for someone who understands her DIVA ways and someone who doesn’t take themselves too serious! Think this little black & white girl is for you? Visit www. spcawake.org or call 919.772.2326 to learn more! is a four-year-old neutered male who might not be as big as the Mike Tyson we all know, but his heart sure is! This adorable, brown-eyed pup has been with the SPCA for way too long, and he’s growing a little impatient. He’s been overlooked time and time again. Right now he’s taking a break from the shelter and living in a foster home, where he’s learning his doggy manners and cool party tricks. Tyson is a gentle boy who really enjoys snuggling. New situations and loud noises make him a bit nervous, but once he warms up to new people, he’s their best friend. Do you have a quiet house, and a gentle heart looking to make a difference in a kind doggy’s life? Give Tyson a chance. Schedule a time to meet him at the SPCA. Call 919.772.2326 or visit www.spcawake.org to read more about him.